1. Score the mackerel skin a few times. Brush all over with 1 tbsp harissa and lay, skin-side down, on a baking sheet. Meanwhile, put the remaining harissa paste and couscous in a large bowl, pour over the boiling chicken stock, stir well, cover with cling film and leave to stand until needed. Preheat the grill to high. 2. Remove the peel and pith from the orange with a sharp knife. Carefully cut out the segments and roughly chop. Transfer to a bowl and combine with the shallot, chilli and preserved lemon. Stir through the honey and 1 tbsp coriander; set aside. 3. Meanwhile, grill the mackerel, flesh-side-up, for 2-3 minutes, then skin-side-up for 2-3 minutes, until just cooked through. To serve, season and fluff the couscous and stir through the sugar snap peas and remaining coriander. 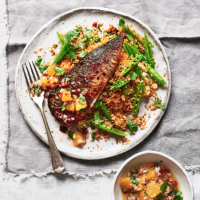 Divide between 2 plates and top each with a mackerel fillet and a spoonful of the relish.